Benfleet Library Closure Information Event on the High Road close to Richmond Car Park on Sat 19th Jan 2019. Shown are various local people all of whom are concerned about the proposed closure. 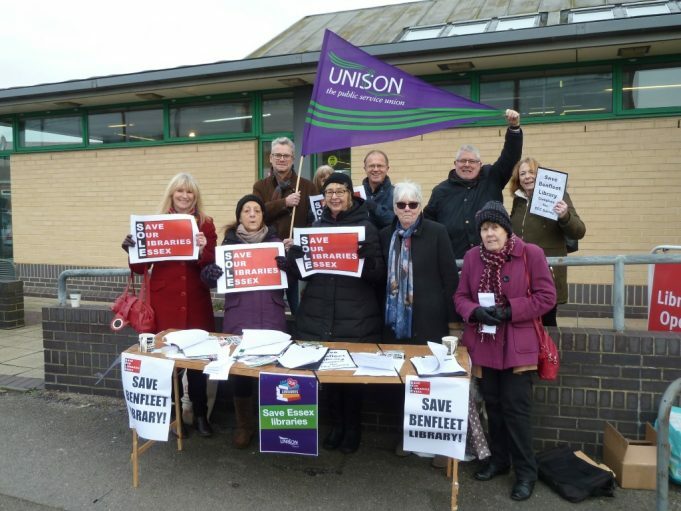 From left to right they are: Unison Representative Tim Sneller, District Councillor Wayne Johnson, Barbara Whiteside, Librarian Christine Coley, District Councillor Tom Skipp, and BCA Member Frank Gamble. Benfleet Library Closure Information Event at the Library on Sat 19th Jan 2019. Shown are various local people all of whom are concerned about the proposed closure. 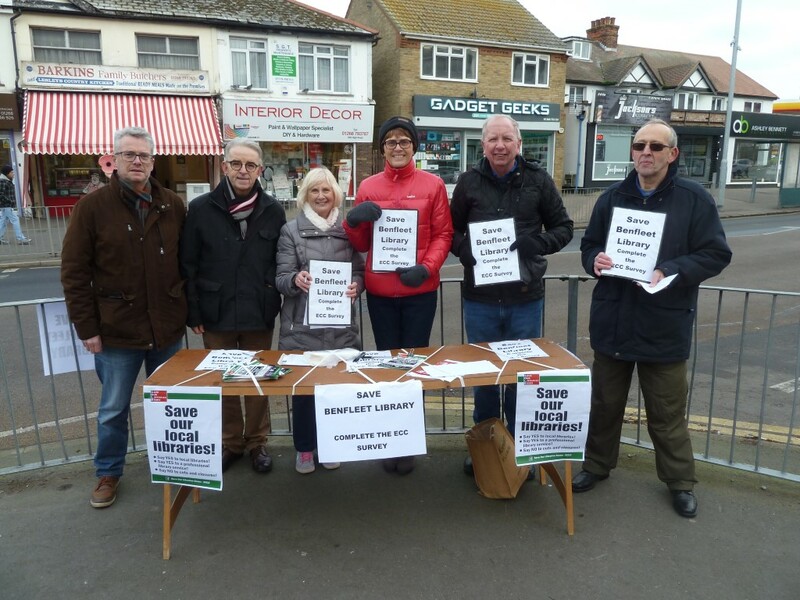 An information event to publicise the closure of South Benfleet Library took place on Saturday 19th January 2019 for 10 am to midday. Two tables were set up: one outside the entrance to Richmond Car Park, the other in front of the Library. They were supported by about 20 volunteers from a variety of areas all united in their support to keep the local libraries open. Among the volunteers were two Castle Point District Councillors from the Benfleet Ward of Appleton: Cllr. Tom Skipp and Cllr. Wayne Johnson. Although the District Council has no powers over Libraries they are nonetheless doing what they can to support them. Also present was Tim Sneller a local resident who is also a Unison representative. He has twin concerns about the loss of a local facility and the loss of jobs of the Library Staff. He has assisted the event with the loan of a table and posters. Others came from a variety of backgrounds including several members of the Essex Home Library Service, several members of Benfleet Community Archive and individuals who support libraries. During the two hours a total of about 500 signatures were gathered and commitments obtained from people to complete the Online Survey. Also there were many car horns sounded in support from people driving by. All round it was considered to be a useful communication event. This is a very important part of the community. It should be left alone as there is not much else in Benfleet now. It help the older generation in the area.